This sailboat was my last project of summer. As much fun as it was to do it, I’m ready to feel fall in the air and definitely see some fall motifs on my frame. But, as with everything hooked so far, its been educational. By accident. 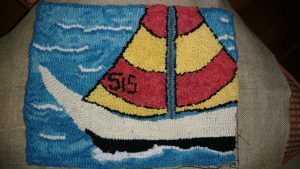 The pattern came from Deanne Fitzpatrick’s Mystery Pattern of the Month for July. The packages take a couple of weeks to get all the way from Canada to Georgia but when I saw it, I was ready to jump in! Linda Bell from LB Woolery helped me with the color plan. She dyes some beautiful wools Then, once underway, the plan changed.